Another week of little progress, and yet somehow much to report. After all the work and problems of getting the donor running, we put the M.G. aside for a while and got back to cutting metal. This of course is what building a Locost is all about, not tinkering with 40-year-old motors. 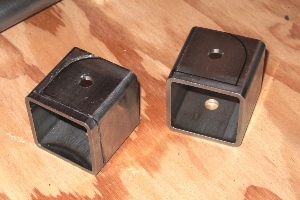 And fabricating parts puts a thankful end to the slow and painful design process. The rear differential bracket, just one example, went through dozens of design iterations because it's just way too easy to make changes before the part is actually built. 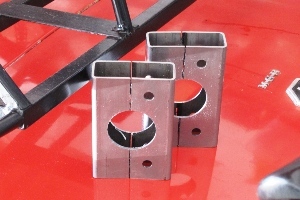 We had envisioned constructing differential brackets from 4"x 1-1/2" rectangular tubing, by drilling holes and cutting the openings for the axle tubes with a hole saw, then finishing them off by splitting the brackets down the center of the hole. Even today, we're shocked this actually worked. The only problem is that the holes are a little small for the 2-1/2" axle tubes, because we cut the holes with a 2-3/8" hole saw, because a 2-1/2" hole saw cuts 2-9/16" holes in metal. Why we don't have the technology to make a 2-1/2" hole saw that cuts 2-1/2" holes is a mystery. So the rear suspension is almost done, and looks great as shiny metal parts always do, at least before welding. For the rear shock brackets we settled on something close to the book design. 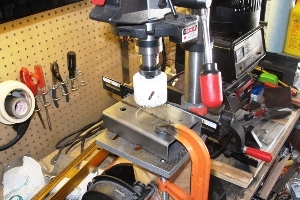 We're cutting the top plates and the forward support gussets from a single piece of 2" square tube, and the shock mount from a 1-1/2" length of 1-1/2" square tubing, to be mounted vertically on the top plate. This limits the amount of welding needed, eliminates some dead weight, and gives us a fraction of an inch more wheel travel than the book. Also on the cutting board are the lower rear pickups for the front suspension, which have to be angled five degrees on the bottom. We're still cutting with a Dremel, however we recently scored a loan of an air-powered angle grinder, and we're anxious to give it a try. We still have a lot of cutting to do for the engine mounts, steering rack mounts, radiator mounts, and possibly other mounts, and we need to get started soon before the designs change. Plus, down the road we have to cut the floor, firewalls, and bulkheads, so we're really counting on that grinder. The big news is, we drove the M.G. on Saturday. The fuel pump is finally in place and working beautifully, i.e. 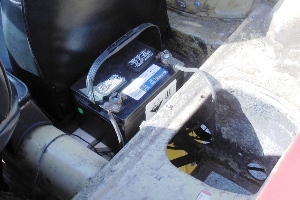 not leaking, and the battery is now "installed" in a manner that allows it to be carried along with the car. Unfortunately the car did not start immediately Saturday, or even after one or two tries. It needed quite a bit of prodding, and only after half an hour of tinkering, coaxing, testing, and cussing did it finally light up. 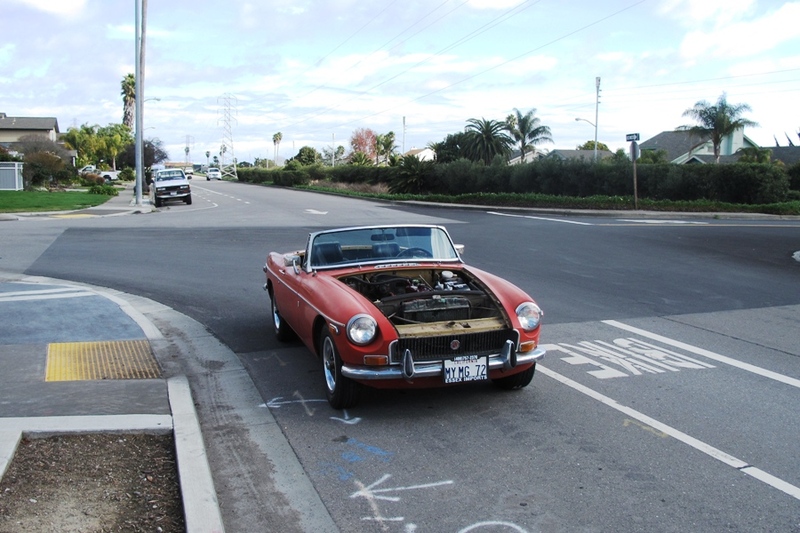 It sounded great, though, and ran reasonably well on at least three cylinders, and sometimes four. Which was good enough for us, so we took the car for a short spin up and down theA block, and it never completely died although it seemed determined to do so. The good news is, the clutch worked perfectly and the gearbox felt excellent. Our M.G. experience includes only the early crash-bottom boxes, which we now know were dangerously weak. This later model was really solid, with the 3-2 synchro still functioning, which is really amazing after all these years. And no whine or clunk, or noise of any sort from the differential, a major bonus. Amazingly, the brakes still work. Sort of. Encouraged well beyond the bounds of common sense, we decided to coax the car into a longer drive. We turned around and cruised on past the house, smiling and waving to the neighbors, blipping the throttle as needed to keep the engine lit. We continued on down the street to the main drag, where our first attempt to stop the car with the rusted brakes put us ten feet out into the intersection. Cross traffic was light, so no harm, no foul. 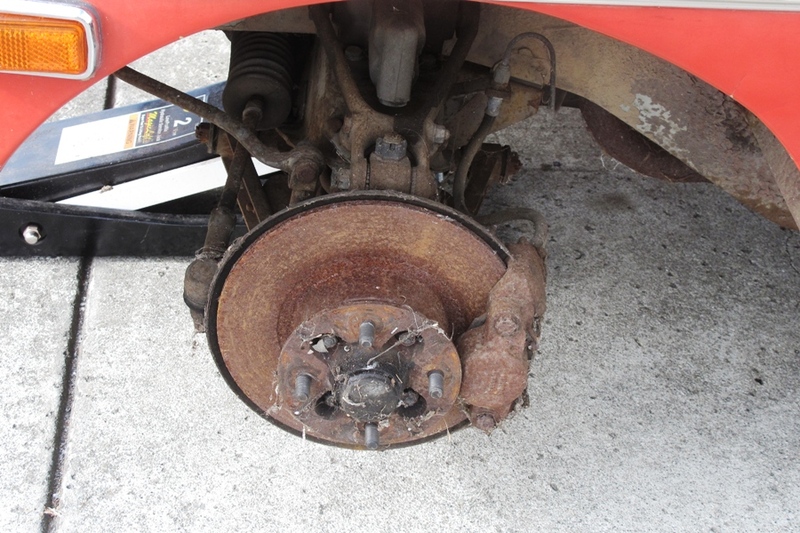 And the brakes did ultimately work, they just needed a firmer foot on the pedal. Up the boulevard we motored confidently, the engine alternating between hesitant and stopping altogether, shifting up to fourth gear, gearbox slick as Teflon. The car felt great, the steering quick and direct, the suspension firm and responsive. Even the seats were comfortable, resting unbolted on our makeshift plywood floor. Despite the occasional loss of power, a dip of the throttle would get things moving again, which allowed us to get a good mile from the house before everything quit completely. We stood in the street and fussed with the ignition for quite a while before a neighbor took pity and offered to drag us home with his pick-up truck and an old chain. Thankfully, the tow was uneventful. For good measure we even let the truck haul us in gear with the ignition on, which actually relit the engine, allowing us to pull into our driveway with a shred of dignity left. We waved a thank you to the truck driver and he drove off, no doubt reasonably confident we wouldn't sully his neighborhood again with our rusty old wreck. We spent the rest of the afternoon diagnosing the ignition, testing every component and resetting the dwell and timing. We got things working to the point where the car would start, but die within 10-15 seconds, every time. We were fairly certain the problem was no longer with the ignition, which left the carburetors as the primary suspect, which was unfortunate because carburetion is one of those mystery automotive technologies that you're never quite sure why it works and you definitely never want to have to mess with. So we called it a day. We did spend some time that evening researching SU carburetors online, and came away convinced that we have a punctured float. Maybe even two punctured floats. These are easy to replace, which makes them the ideal problem to have when your M.G. isn't running. The main symptom of a punctured float is an extremely rich mixture, and we have that in spades. We pulled one of our brand new spark plugs and found it completely black. Rich mixture. We also noticed a puddle of fuel on the carb inlet, and were pleased to read that this is yet another symptom of a punctured float. Our second best option would be a stuck metering valve. Or two stuck metering valves. Metering valves stop the flow of fuel into the carbs when the floats indicate the fuel bowls are at the correct level for the proper air-fuel mixture. The valves are only a little harder to replace than floats, and when they stick they have the exact same symptoms as punctured floats. And old gas makes things stick. So there's hope. All things considered, we're fairly certain we can get these carburetors working without overhauling them completely.